Is Money Less Green in Hartford? I’m perplexed. It appears that money available to be earned in Hartford is less valuable than money that can be earned in West Hartford. Even though that goes against the basic idea that a dollar is a dollar. 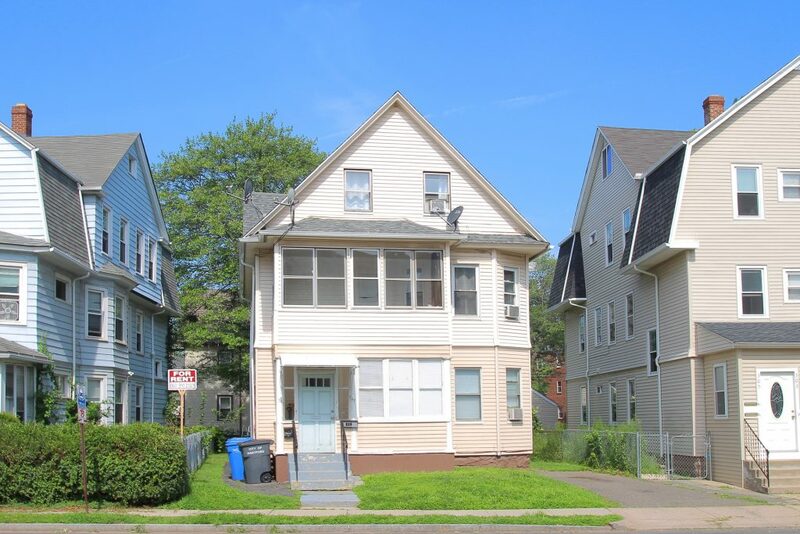 We have a 2-unit building for sale in Hartford that is quite close to the West Hartford town line. For those interested in the specifics, it’s at 307 New Park Avenue, which is across the street from the movie theater and just south of I84. That location is not closely linked to any Hartford neighborhood. In fact, the closest residential enclave to the homes on this triangle of land is in West Hartford. What confuses me is that investor buyers aggressively pursue properties in West Hartford, but they don’t seem interested in a building a block away that is similar in layout and vintage, and has better economics. Only four 2-unit buildings sold south of the highway in West Hartford over the past year. The table below compares those buildings to our listing. Rental income is not available for all the properties on the list. However, the actual rent our listing generates is in line with two properties that sold in the $260,000s. We’re only asking $209,900 … and our property taxes are much lower. Our listing has the most favorable ratio of income to expenses, by a long shot. Why the big difference in value? It could be that the buildings have different attractiveness to owner-occupants, but most West Hartford buildings are purchased as investments. So the buyer is unlikely to live in any of these properties. The tenants pay their own utilities in our listing, so that’s not a hidden expense to the investor owner that is holding back our price. The condition of the property is fine, so it’s not like we’re marketing a place in poor shape. Tenants generally ensure that the rent they pay reflects the condition anyway, and we know the rents. Investments in the Hartford multi-family market have even shown better appreciation over the past few years. Median prices increased 32% compared to 4%. It is interesting to note that our $209,900 asking is a lower price than any West Hartford 2-unit building sold for since 2016. A.) The building is barely outside of West Hartford. B.) Actual tenants pay strong monthly rents and utilities. C.) Market appreciation has been strong in Hartford. There is money to be made by operating 307 New Park Avenue as an investment property. More money than buying a similar vintage 2-unit building a block away in West Hartford. Note: All data is from the CTMLS, and deemed reliable but not guaranteed. It represents multi-unit properties marketed as 2-unit buildings. One West Hartford property that was a commercial use simultaneously marketed as a 2-unit was removed from the data set. Amy and Kyle Bergquist are full-time residential real estate agents in Central Connecticut. They represent buyers and sellers of single-family homes, condominiums, and multi-family properties in most of the communities in Hartford County. Rather than being salespeople in the traditional sense, they think of themselves more as analysts and advisors. Ultimately the goal is to get their clients the best results possible for their situation - not convince them to do a deal.